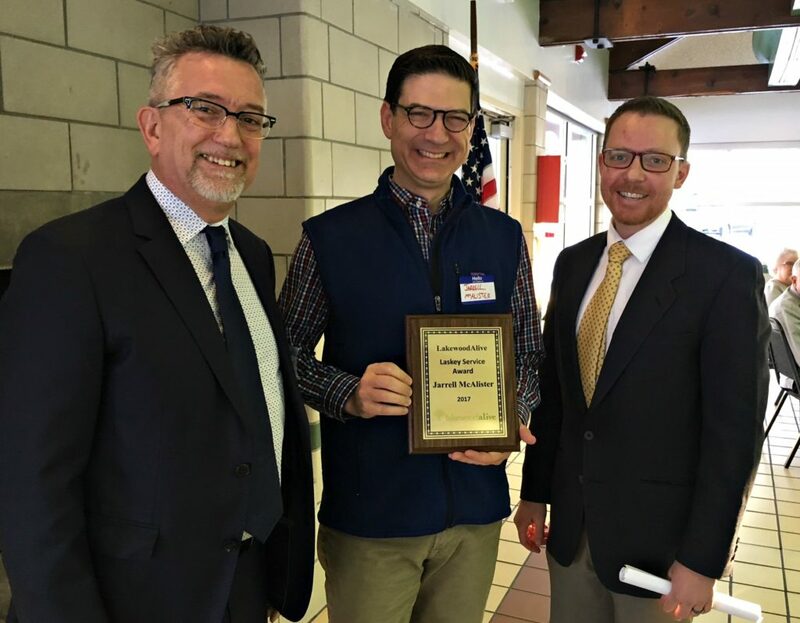 LakewoodAlive’s 2018 Volunteer Appreciation Breakfast took place on January 19. LakewoodAlive hosted its Annual Volunteer Appreciation Breakfast on Friday morning, January 19, in the Women’s Pavilion at Lakewood Park. 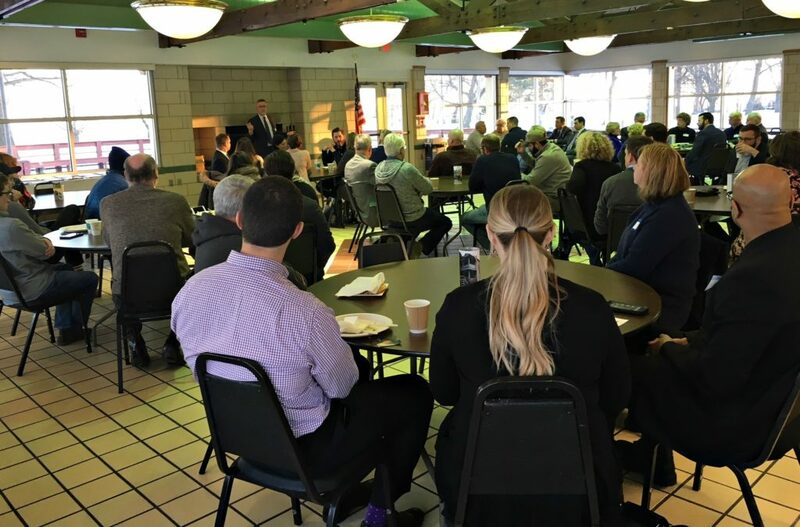 The event, attended by nearly 75 community members, featured coffee, waffles and stories of remarkable volunteerism. LakewoodAlive recognized the nearly 750 volunteers who, in 2017, contributed their time and talents to supporting the nonprofit community development organization and to helping improve quality of life in Lakewood. Jarrell McAlister was presented with the 2017 Laskey Service Award. A special award is bestowed each year to a volunteer who demonstrates uniquely exceptional commitment to LakewoodAlive. The Laskey Service Award was named for Tim Laskey, a founding member of LakewoodAlive. This year’s Laskey Service Award recipient is Jarrell McAlister. Jarrell, a LakewoodAlive board member, has proven instrumental to furthering LakewoodAlive’s mission in various ways. He recently spearheaded the process of helping LakewoodAlive to construct a new strategic plan that will help guide the organization for the next three years. In addition to serving on the Marketing Committee, Jarrell volunteers his time at nearly every LakewoodAlive event, assisting with everything from setup to execution to teardown. He also helped lead a “Why I Love Lakewood” campaign that resulted in an attractive new window display at the historic Curtis Block building in Downtown Lakewood. LakewoodAlive Housing Outreach Director Allison Urbanek and fellow members of the “A Team” pose with their new t-shirts. 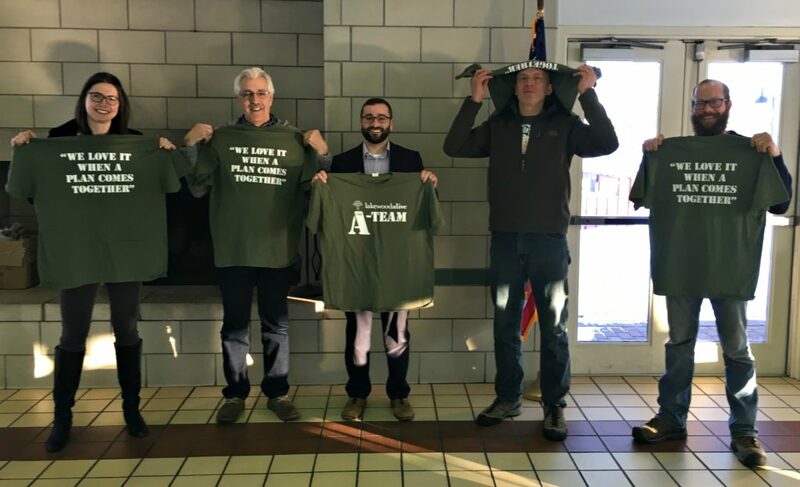 As a special closing to this year’s Volunteer Appreciation Breakfast, members of the “A Team” – an all-star squad of volunteers that tackle challenging projects on behalf of LakewoodAlive’s Housing Outreach Program – were presented with custom t-shirts designed by LakewoodAlive board member Jim “JP” Ptacek.